2019 Mental Health & Dignity Day replaced previous Recovery & Empowerment Days and may be a real turning point for our movement. 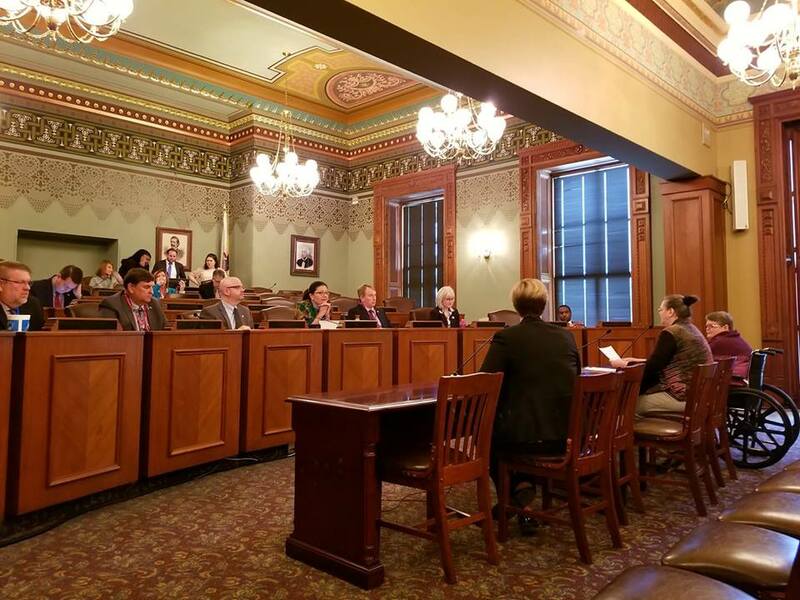 The Illinois House Mental Health Committee held it’s first-ever subject matter hearing for consumers/clients/patients of mental health services. This hearing was requested back in November 2017 and, despite that it took 481 days for the committee chair to honor our request, committee members were attentive and appeared genuinely interested in our experiential testimony. The hearing began with testimony from a Representative who did not identify as a “patient” but was afforded a professional courtesy prior to consumer/client/patient testimony. She was seeking support for a bill she sponsored, but there was no evidence she sought out our community. Next AJ French issued A Call For Dignity. Everyone in the room stood and read the call in unison as House Mental Health Committee Members also stood and gave their undivided attention. It was a reverent and almost holy moment, preparing everyone to hear our cries for mental health justice. Testimony from AJ French and Julie Seest (read by Heidi Graham) poignantly demonstrated need for healthcare providers, particularly hospitals, to follow self-determined healthcare choices of persons with mental healthcare needs. Quality healthcare means honoring choice. Testimony from Regina Crider and Shelly Richardson illustrated the importance of funding peer-operated organizations. Richardson went on to say that the Certified Recovery Support Specialists (CRSS) professionals be hired in prisons and schools, noting the peer support model from the 1970’s. Testimony from Patrick Norris raised the issue of lost peer support funds. GROW was previously funded at $833,308 and their Illinois office remains closed as of this posting. GROW funding was discontinued effective 7/1/15 as part of the FY16 budget cuts and, since then, a budget for consumer-operated services providers has not been reinstated. Throughout the morning, people repeatedly requested additional hearings be held in southern and northern Illinois to give people more advance notice and statewide opportunity to participate. Time will tell whether or not committee members will be responsive to this and other requests. For some reason, the committee clerk does not have in her possession the full audio testimony from this hearing. A partial audio has been provided to Gift of Voice. Gift of Voice needs some technical assistance in getting the file uploaded and posted on this page so more people can hear our voice. There is much more to add, but this is enough for now.